Cancer is a leading cause of death and morbidity worldwide, and with the ageing of the population and lifestyle trends, its incidence is likely to continue to rise. Cancer is, therefore, an important core theme of medical research at the University of Plymouth. Our main research questions are (1) what are the differences between normal and aberrant signaling which promote metaplasia and cancer, and (2) how can biological information and genetics be used in translational and clinical research strategies to improve patient therapy globally? For a broader overview of work in this area across the whole faculty view our Cancer page. Human epithelial cells in culture. Image copyright (C) 2014 Bing Hu. The controlled generation of new neurons and glia cells in the brain from Neural Stem Cell (NSC) progenitors is crucial not only during embryonic development but throughout adult life. Deregulation of adult NSCs or their lineage can lead to a variety of brain disorders, including tumour formation. Our team uses one of the best in vivo genetic models available, the Drosophila central nervous system, to reveal signals controlling Neural Stem Cell mitotic activation, cell fate and lineage maturation in both normal and pathological conditions such as upon brain tumour initiation and growth. Our studies involve functional genetics, gene expression analysis, biochemical and imaging assays. We translate our findings to the human brain using human brain cell cultures, tissues and tumour samples. 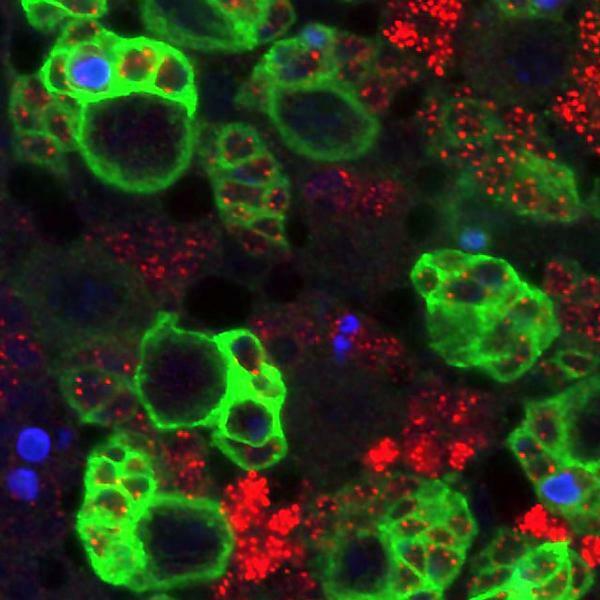 Stem cells are the cornerstones of organ development and maintenance. Their ability for self-renewal and for generation of differentiated progeny have not only attracted interest in developmental biology but also in regenerative medicine. At the same time, malignant forms of the stem cells, so-called cancer stem cells, seemed to play a key role in many types of cancer and their resistance to therapy. To understand what turns a normal stem cell into a cancer stem cell, we are studying the regulatory networks underlying the unique properties of stem cells. For this purpose, we have established computational resources like our webservers StemCellNet and StemChecker. Since normal and cancer stem cells share many features, a better understanding of their regulation can be helpful to develop effective treatments both in regenerative medicine as well as oncology. My research is on neuromuscular disease, especially motor neuron disease and neurooncology. Current work on motor neuron disease is mainly clinical and includes genotype-phenotype analysis and clinical trials. In neurooncology we focus on cell biology studies to find and validate new therapeutic targets as there is a great medical need to find new treatments. I lead our brain tumour research team, who make up one of four UK Brain Tumour Research Centres of Excellence supported by the charity Brain Tumour Research. Simon Rule is a Consultant Haematologist specialising in lymphoma (cancer of the lymphatic system). He runs the national trials in Mantle Cell Lymphoma, which is the most aggressive form of lymphoma. There are four studies into this nationally and two are co-ordinated from Plymouth Hospitals NHS Trust, where Dr Rule works. My research focuses on lymphoproliferative disorders especially mantle cell lymphoma and chronic lymphocytic leukaemia. n particular understanding the biology and interactions of neoplastic lymphocytes within nodal and bone marrow niches with assessment of key signalling pathways and response to targeted novel agents such as BTK inhibitors. My current studies are investigating mechanisms of drug resistance and establishing biomarkers to help predict or define response to treatment. By employing a variety of approaches including molecular and cellular biology, immunology, omics, next-generation sequencing, bioinformatics, animal models, clinical tumour samples and relevant data, my research is dedicated to delineate mechanisms on how key molecules (such as microRNAs, lncRNAs, and RN181 E3 ligase), signalling pathways (such as Notch signalling), tumour cells, and tumour stromal cells (such as endothelial cells, infiltrating lymphocytes and tumour-associated macrophages) in tumour microenvironment regulate tumour growth, metastasis and tumour response to therapeutic interventions (cross-interactions among chemotherapy, targeted therapy and immunotherapy). Our aims are to dissect mechanisms of tumour growth and metastasis, develop novel therapeutic targets, and improve therapeutic efficacy by optimal combinations of chemotherapy, targeted therapy and immunotherapy. CCN genes modulate core stem cell signalling pathways including TGF beta, BMP, Wnt – Beta-catenin and Notch. Deregulated stem cell signalling forms the basis of tumourigenesis and also resistance to therapy. Abberations in CCN expression have been associated with haematological malignancy and also many solid tumours. Current projects investigate the roles of CCN1 in driving disease aggression and resistance in prostate cancer, leukaemia and lymphoma. Identification of novel strategies will enable development of specific targeted agents for patient benefit in modern medicine. My research interest is in the control of myelination and repair in the peripheral nervous system (PNS). The PNS is myelinated by Schwann cells which ensheath and myelinate the large caliber axons and allow rapid (saltatory) conduction of nerve impulses. Most recently I have begun to investigate what underlies the remarkable ability of Schwann cells to regenerate and repair injury in the peripheral nervous system and how proteins such as c-Jun and Sox-2, both transcription factors, facilitate this repair and cell plasticity. Loss of the tumour suppressor Merlin causes tumours of Schwann cells, schwannomas, and we are also interested in the initiation events and changes in cell signalling that occur in these tumours. Using various in vivo and in vitro models, and through broad international collaborations, my group’s research focuses on the following. (1) Molecular mechanism of cancer initiation, and early intervention and prevention, in skin non-melanoma cancer and oral cancer. (2) Signalling interference in stem-cell fate determination. (3) Epithelial-mesenchymal interactions in controlling organgensis and regeneration. Hematopoiesis is a complex but precisely regulated process, with hematopoietic stem cells (HSC) differentiating to give rise to the progenitor cells of lymphoid, myeloid and erythroid lineages. An array of transcription factors (TF) and other signalling molecules control this lineage differentiation process in order to keep us healthy and immune competent. Anomaly in these TFs' activity or loss of any component of the signalling pathways very often results in pathological conditions such as immunodeficiency or leukemia and lymphoma. My lab is working to elucidate the role of the Nuclear Factor of Activated T cell (NFAT) family of TFs in HSC maintenance, differentiation of various lineages, and in the disorders that are associated with this process.